Happy Monday! I hope everyone had a good weekend. 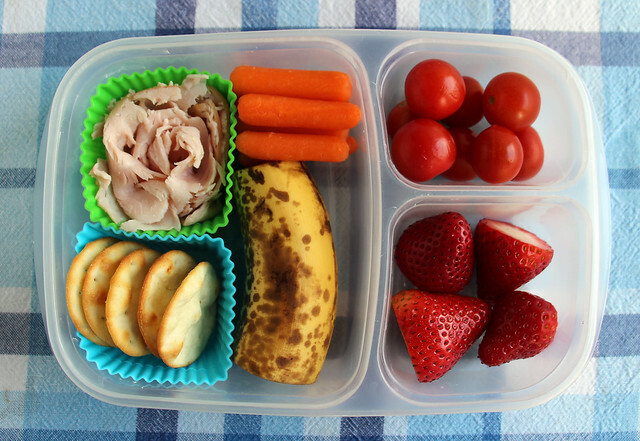 Are you ready to see what my kids had for lunch last week? Let’s dig right in! Monday morning I was all about the quick and easy lunches, so I grabbed a couple of our EasyLunchboxes bento containers and set to work. Wyatt’s lunch had deli turkey in one of our square silicone cups , along with a few crackers to go with it in another. He also had an Easter egg with jelly beans, a half banana, radish chunks and strawberries. 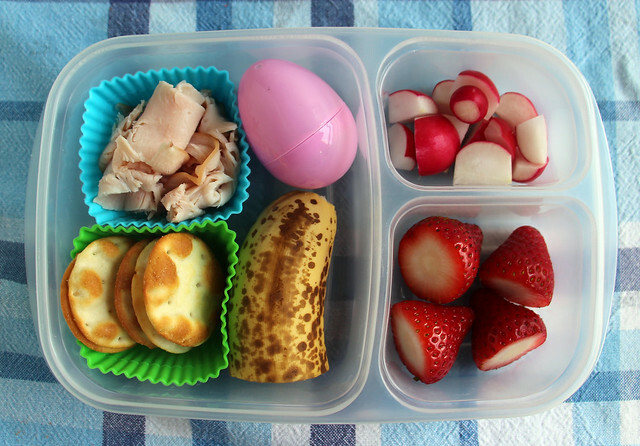 Augie’s EasyLunchbox also had turkey, crackers, a half banana and some strawberries. 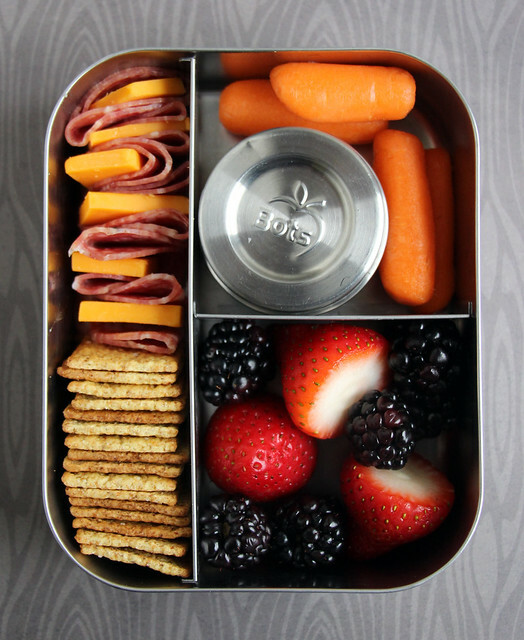 I swapped in carrots and cherry tomatoes for the candy and radishes in Wyatt’s lunch box. 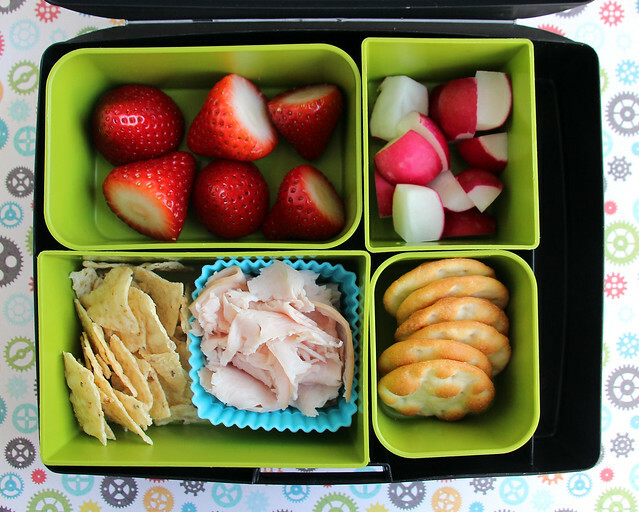 On Tuesday, Wyatt had almost the exact same lunch he had Monday, but this time I packed it in a Laptop Lunches box: strawberries, radishes, crackers, turkey and a few chips. Bor-riiiing! Augie had strawberries, cucumber slices, crackers and deli turkey. 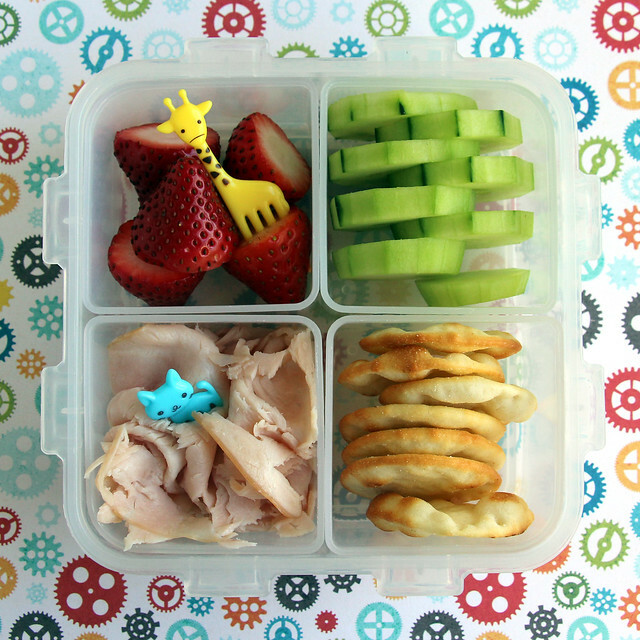 It was packed in our Lock & Lock 4-up bento and I jazzed it up a bit with grumpy giraffe and happy kitty picks. 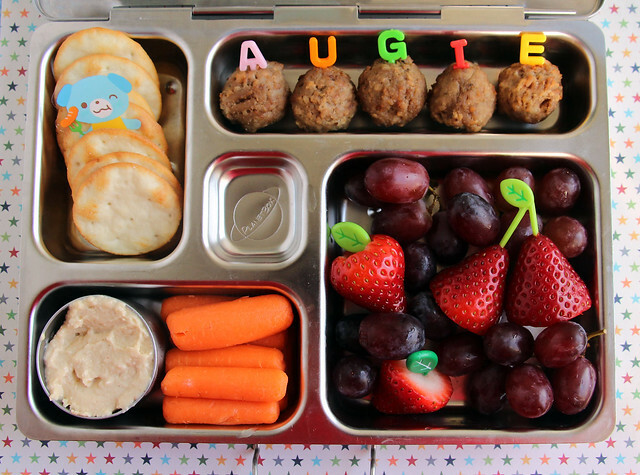 I packed Augie’s lunch in our PlanetBox Rover and since I had some extra time, I spent a little time making it cute. 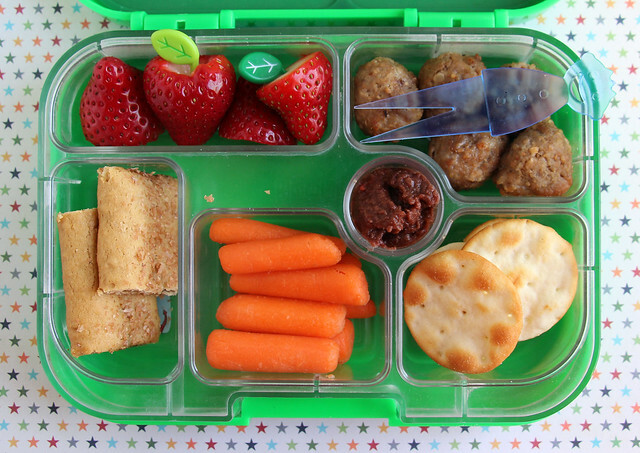 He had crackers with a piece of dog baran tucked into them, freezer meatballs with letter picks to spell out his name, strawberries with leaf picks, grapes, carrots and hummus. On Thursday Augie wanted a Spider Man lunch, so that’s what he got. He picked out the lunch box, the decorations and all the food I put in it and he helped put it all together! He’s a great helper. 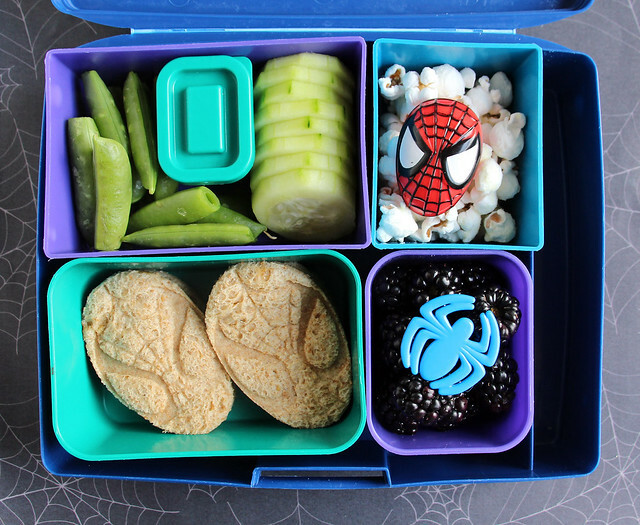 The lunch was packed in a Laptop Lunches box and it consisted of snap peas, hummus, cucumber slices, white cheddar popcorn with a Spidey ring on it, blackberries with a spider ring, and two Spider Man peanut butter and jelly sandwiches. Wyatt opted for school lunch. Friday morning, I saw this photo on my friend Robyn’s Instagram feed and I immediately went into the kitchen to duplicate her folded-salami-with-cheese-in-it trick in Wyatt’s lunch. I also added wheat thins, carrots, a tub of black bean dip for dipping, blackberries and strawberries. This was packed in our LunchBots Trio. Mama and Dad were both cut and stamped with my Animal Palz cutter set and I added a little baby panda in Mama’s arms too. They each got head gear too — a bow for Mom and a baseball hat for dad. 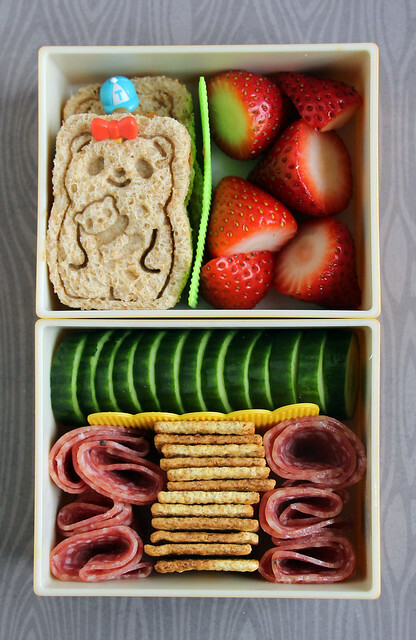 The rest of the lunch was strawberries (separated from the sandwiches with a silicone divider to keep them from making the bread soggy), Persian cucumber slices, salami and wheat thins.